Junior Geeks, funded and powered by the U.S. Department of State and Innovation Centre Kosovo, is an inclusive platform for high school students to discuss, explore and learn about technology, entrepreneurship, science & innovation. It is becoming clearer every day that Kosovo’s future in terms of economic and social development is positively correlated with an inclusive workforce of intellectual and technical abilities. According to the Kosovar Ministry of Economic Development, technology is the sector that can directly impact economic growth and the inclusion of women in the labor market. It is also apparent that many local companies are outsourcing intellectual services like programming and digital solutions thus creating new workplaces, despite the high unemployment rate in the country. Despite this, non-technical programs still dominate as a major preference of new college students, likely due to a lack of exposure to innovative career and study opportunities. Unfortunately, our education system doesn’t offer enough hands-on experience and the existing curricula can have a deferring effect as apparent by the low number of students in tech programs.On a grander scheme, such initiatives open the doors to the introduction of practices that education system such as high schools for hosting such clubs and activities - and teaching a more hands-on STEM curriculum. 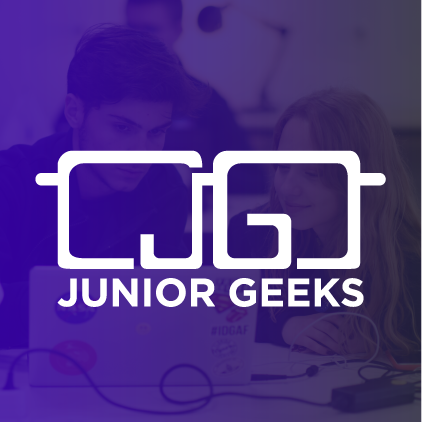 Junior Geeks, funded by the U.S. Department of State, is an inclusive platform for high school students to discuss, explore and learn about technology, entrepreneurship, science & innovation. The goal is to kickstart a wave of interest in research, science, technology and entrepreneurship among youth in Kosovo. Junior Geeks also aims to help youth consider tech-oriented programs as their future careers, as well as identify with their entrepreneurial spirit. This platform is open to students aged 15-18 years old, and aims at grouping 90 students into cohorts that discuss, explore and learn about topics such as technology, entrepreneurship, robotics, coding and basic of algorithm, cybersecurity, online marketing, multimedia, social media management, search engine optimization, artificial intelligence, machine learning, blockchain, scientific research and methodology, data analyses, business model, business planning, presentation skills and body language. This platform is highly lacking in our education system and represents a gap in knowledge which needs to be addressed to open career and study opportunities for youth. To date, there is no such initiative that fosters an inspiring climate for youth to materialize their tech, innovative and entrepreneurial talent. Junior Geeks aims to help youth consider tech-oriented programs and careers as well as identify their entrepreneurial spirit. This will serve not only as an intellectual and social resource but as an economic power for the country. Furthermore, it might not only have an impact on economic development but function as means to introduce increased opportunities for underrepresented categories of society such as girls and minorities who through their involvement and development of their STEM (science, technology, engineering and math) abilities will find ways to shape their ideas and attract opportunities in these fields. In addition, the platform will offer a space for youth to express their talent and learn the basics of these understated fields so they are prepared to either take initiative to a.) innovate and/or create business opportunities or b.) continue the academic advancement on these fields. This project is awarded to Kosovo US Alumni Ms. Eldita Tarani, Mr. Shpend Lila & Ms. Zana Tabaku, by the US Department of State’s Alumni Engagement Innovation Fund 2018. “Junior Geeks” concept was established by the Innovation Centre Kosovo, in 2015.